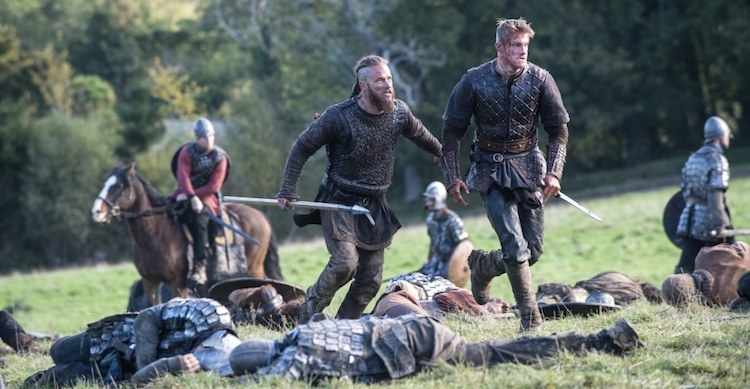 As Vikings returns to our screens, Patricia Bracewell recaps the first four seasons. The very first episode of the television drama Vikings began in the year 793 A.D. on a corpse-strewn battlefield somewhere in the Eastern Baltic. Two warriors, filthy and bloody, slaughtered the last of their enemies before our eyes while, on a distant hill, Odin walked amid the dead against a black and brooding sky. It was clear to anyone watching this opening segment that here was a show that would venture into an ancient world of darkness and devastation. How could it do anything else, given the subject matter? After all, its central figures were the men who struck terror into the heart of Europe for two hundred years. Yet the rest of that episode went in a quite different direction. It introduced a family and a tribe; it focused on relationships, ambitions and, in particular, on a burgeoning conflict between an adventurous young rebel named Ragnar (Travis Fimmel) and a corrupt ruler determined to ruthlessly crush anyone who defied him. It stepped into the Viking world – its beliefs, its customs, and its culture – and brought us along. Vikings is not history. It is story woven from history, from saga, from skaldic poems and from the imagination of its writer/creator, Michael Hirst. The first season explored the themes and relationships introduced in that first episode. Yes, there were bloody Viking raids on England, in particular the infamous raid on Lindisfarne in 793; but most of the action was set in Scandinavia. Inevitably, just before season’s end, we saw the face-off between that rebel Ragnar Lothbrok and the ruthless Jarl Haraldson (Gabriel Byrne). The second season was more ambitious. Ragnar and his followers were still the central figures, but now there were additional story lines set in England in a way that juxtaposed Anglo-Saxon culture and beliefs with those of the Norse, highlighting similarities as much as contrasts. The story skipped forward in time by four years, allowing the addition of new characters, new story lines and new conflicts. There was plenty of blood, so this was not a show for the faint of heart; Odin’s corpse-eating ravens never went hungry. But there was just as much emphasis on the interplay between the characters – desire and jealousy, friendship and rage. The threat of treachery and betrayal always lay just beneath the surface of every scene. Season Three added Paris to the mix, and now we were following numerous different story lines that at the same time were all part of a much larger story. The quality of the production – very fine to begin with – was even better: more ships – real and CGI – even more lavish sets, and breathtaking battle scenes. The cast had to learn how to fight with swords and shields and even how to sail their longships. Writer Michael Hirst discarded the historical timeline, sacrificing it to the demands of good drama. He could be criticised for playing fast and loose with historical figures (I was one who howled) and for carrying his characters into the wrong century, but no one could fault his inspired storytelling. The first ten episodes of Season Four ramped things up again. 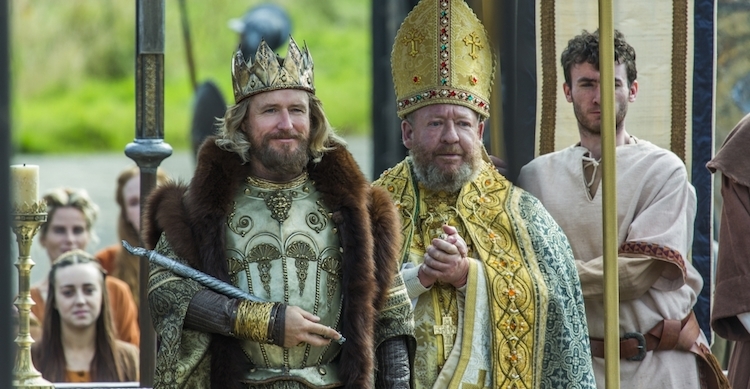 The Anglo-Saxon story line followed a young ætheling (Connor O’Hanlon) to Rome while his grandfather in Wessex (Linus Roache) schemed to grasp more land and more power. In France, Ragnar’s brother Rollo (Clive Standen) was consorting with the enemy in a big way. In Scandinavia, Ragnar’s sons were growing to manhood while our favourite shield-maiden, Lagertha, (Katheryn Winnick) was exacting vengeance on a treacherous jarl. Marriages were forged then broken, political alliances forged then broken, and the season ended with a time skip of eight years that resolved none of the conflicts so that viewers were left with a myriad of unanswered questions and a months-long break to catch our breaths before our heroes would return in the fall for Season Four Part Two. So now we wait to see what Michael Hirst will serve up next in this rampage through Viking history. Anyone familiar with the Viking Age knows that the dragon ships sailed to Byzantium, to Rome, Russia, Iceland, Ireland, even North America. All destinations are open to the sons of Ragnar, who seem poised to step into their father’s shoes. Whether their adventures will be as compelling as those of Ragnar remains to be seen, but given the history and given Hirst’s skill as a scriptwriter, I’m willing to bet that we’re in for a wild ride. 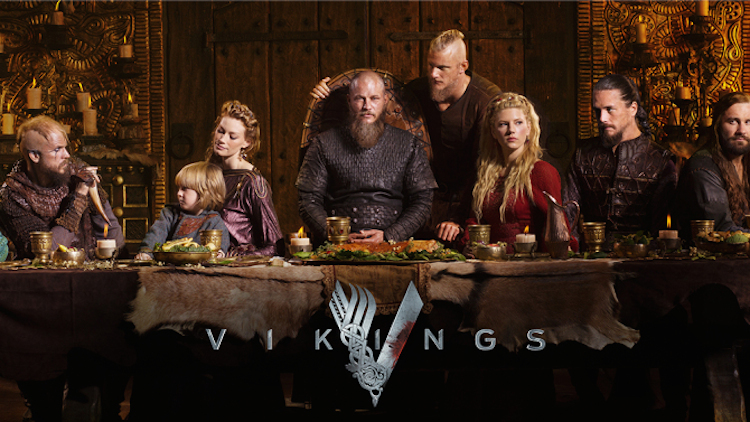 Vikings returns on 30 November on The History Channel in the U.S. and from 1 December on Amazon Instant Video in the U.K.
Patricia Bracewell is the author of the Emma of Normandy Trilogy. The latest, The Price of Blood is out now. She blogs about historical drama on her website and will be covering the next series of Vikings for Historia. Keep in touch on social media for the latest reviews. Read Patricia’s article about the Irish locations used in the show.